Children’s shoes are not just things to grow out of. They are not just dusty relics from the past. The first steps are the most important ones, and your first shoes can be a life-changing experience. Discover footwear made with tiny feet in mind. We are RAK, the traditional Slovak children’s shoe manufacturer. The broad range of color combinations we offer will please even the most fashion-savvy of kids. 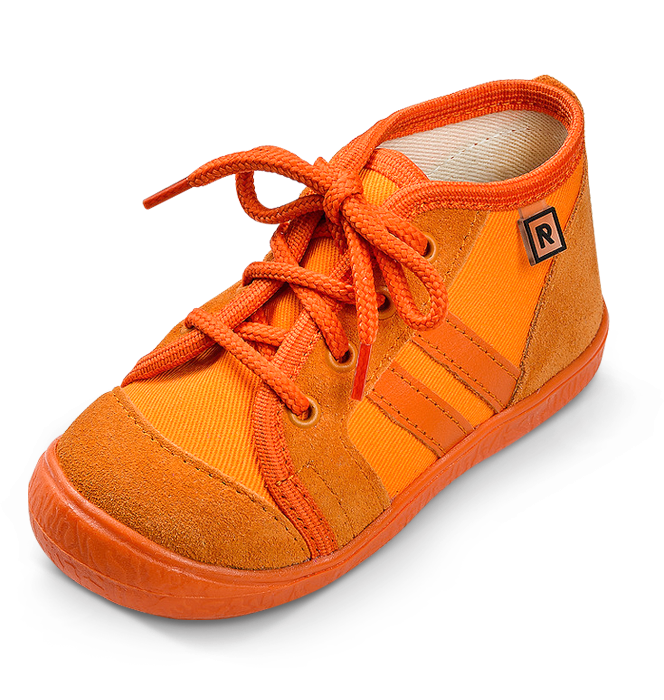 Let them walk out in true colors in their new RAK shoes; over 350 color combinations for little fashionistas everywhere. Founded in 1993, RAK has sold over 5 million pairs of children’s shoes. Our customers come back to us year after year – in the meantime even buying shoes for their own children; 5 million RAKs on the road. Some of our shoes are made up of 76 individual parts, and it takes 55 manufacturing stages to put them together. A pair of our shoes passes through 30 pairs of hands before leaving our workshop; 76 parts + 55 stages + 30 people = one RAK shoe. Experienced craftspeople treat each and every detail of the shoe with the utmost care. Every stage and every detail is important. We are diligent because we care about your children’s feet. Have a look for yourself. We have been around since 1993. We founded our company because the work we do is the work we love – and because of our respect for our craft. We are shoemakers. We started our business on one table, and to this day we live to see happy children learning to walk their walk in our shoes. Making shoes for children is a huge responsibility, and being allowed to do it is truly humbling. All the shoes we produce hold product safety certificates, and some of them have been awarded the prestigious Žirafa and Czech Quality licenses. As a company active for over 20 years, in 2015 RAK was presented with a Slovak Stable Company award. At RAK we are grateful for awards for materials and quality, and our product safety certificates. They assure us that we are on the right track. The greatest reward we get, however, are happy children exploring the word step by step in our shoes.